Only twenty short years later, a small group of Chattanoogans decided they would try to save some of the area’s fading railroad history. Passenger rail service was in decline and most antiquated steam locomotives had already disappeared into the past. But the Tennessee Valley Railroad Museum (TVRM) was founded in 1961 and began a labor of love by preserving, restoring, and operating historic rail equipment. And, as they say, “the rest is history”…literally! 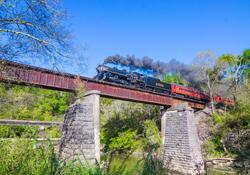 The Tennessee Val ley Railroad Museum is located not far from the Chattanooga Airport. A short drive from downtown, it is easily accessible by taking I-24E, I-75N, and Highway 153N (Jersey Pike exit). TVRM is an unusual museum in that it moves! 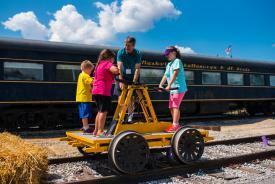 While there are a variety of locomotives (both steam and diesel-electric,) passenger coaches, Pullman cars, and additional items on display, the highlight is a ride on the rails. Picture the scene: A vintage train arrives at Grand Junction Station as anxious passengers wait to climb aboard. 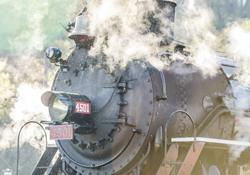 As a whistle sounds, the Missionary Ridge Local train begins its journey into the past. Rails clickity-clack under foot as the train crosses several bridges and passes through pre-Civil War Missionary Ridge Tunnel. These tracks have been in place for years: 160 years to be exact! As one of the first railroads into Chattanooga, the historic East Tennessee, Virginia & Georgia Railway was an important line of commerce for both freight and passengers. It ended up as part of Southern Railway lines and was removed from service around 1950 when a new route was built to bypass the antebellum tunnel to improve both efficiency and capacity. TVRM volunteers took over in 1968 by rebuilding the tracks and beginning tourist runs a short t ime later. This history comes alive as the train rumbles through this same Missionary Ridge Tunnel and eventually arrives in East Chattanooga. Additional historical information is interpreted as passengers disembark at this location to view the locomotive as it is turned around on a giant, 1916-built turntable. This is quite a sight! Who knew a 150-ton locomotive could be turned 180 degrees on a makeshift carousel using power from a small electric motor? Afterward, the tour guide and conductor lead riders into the restoration shop where a short presentation is given describing the work that goes into keeping rail equipment in good working order, not to mention the complete restorations to service. Once the tour is done, passengers return to their train for the ride back to Grand Junction. Think of it: You can still experience the way Americans traveled on an everyday basis, just like the old days when it was a necessary part of life. We bet your kids didn’t know the past was such a blast! 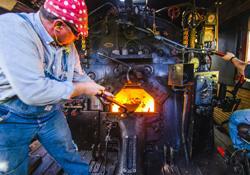 An interactive “hands on” experience, riding this train is like getting inside a history book if only for a short time. Missionary Ridge Loc al service is the standard train ride at TVRM, and the most frequent. But there are plenty of additional options, including Dinner on the Diner trains on many Saturday evenings, longer weekend Chickamauga Turn and Summerville Steam Special excursions into Northwest Georgia, plus many special events. 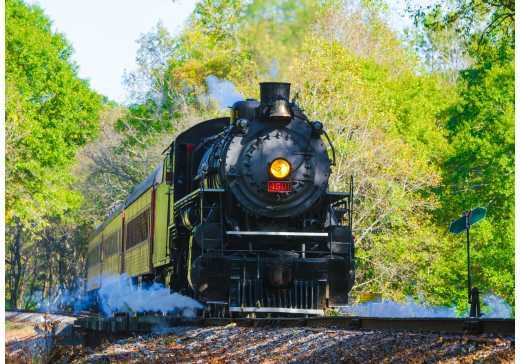 Some of the annual activities include Bunny Trains in the spring, Tennessee Valley Railfest in September, Halloween Eerie Express Fun House trips in October, and the always popular North Pole Limited holiday rides in November and December. One of the biggest events is held in May when, for two weekends, Thomas the Tank Engine makes a stop at TVRM for the exciting Day Out With Thomas festival. This year marks the 20th year for a visit to Chattanooga by Thomas, but the very first for Thomas’ best friend, Percy! But wait, there’s more! TVRM hosts Summer Camps for kids, as well as birthday parties, group visits, charter trips, special meetings, and other customizable outings. Additionally, Hiwassee River Rail Adventure trains operate out of Etowah, Tennessee, which is a beautiful trip through the Hiwassee River Gorge and around a “loop” where the train gains elevation by making a full 360-degree corkscrew, crossing over its own tracks. One of Chattanooga’s “trademark attractions," the Tennessee Valley Railroad Museum has a lot of history to offer! Make a train ride part of your visit to Chattanooga. Track down information, schedules, and online ordering here. Oh yes, and, "All Aboard!"